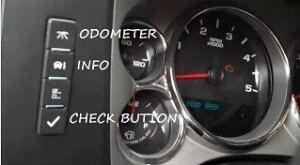 Reset oil service light indicator Chevrolet Truck Duramax. How do you reset oil service light indicator Chevrolet Truck Duramax. If CHANGE ENGINE OIL light does not go out. Then turn off the ignition and repeat steps 1-3. Turn the ignition off and then start the engine. Now verify that the indicator has been reset. Another procedure how to reset oil service light indicator Chevrolet Truck Duramax. Pres i button. Until display show OIL LIFE REMAINING. Picture below. Then pres and hold check button. Picture below. That it is the full procedure how to reset oil service light Chevrolet Truck Duramax. If you like to reset any maintenance oil light after an oil change. Or reset check engine light, airbag light, inspection key or insp errors when maint reqd, forChevrolet cars. Or any error which appears on the display. Write in the search box the car name for which you want to find information, and find how to reset other service reminders when by yourself. Click hear to see full procedure how do you reset the oil light indicator. How to reset the maintenance light and how do you reset service light for all Chevy vehicles.